Most people need to invest serious thought into coming up with good putdowns. And then there’re individuals like gender bender Ranma Saotome – seen here trying on one of his fiancée Akane Tendou’s outfits – who’s got such a knack for hurling insults that he does so without even realizing it. 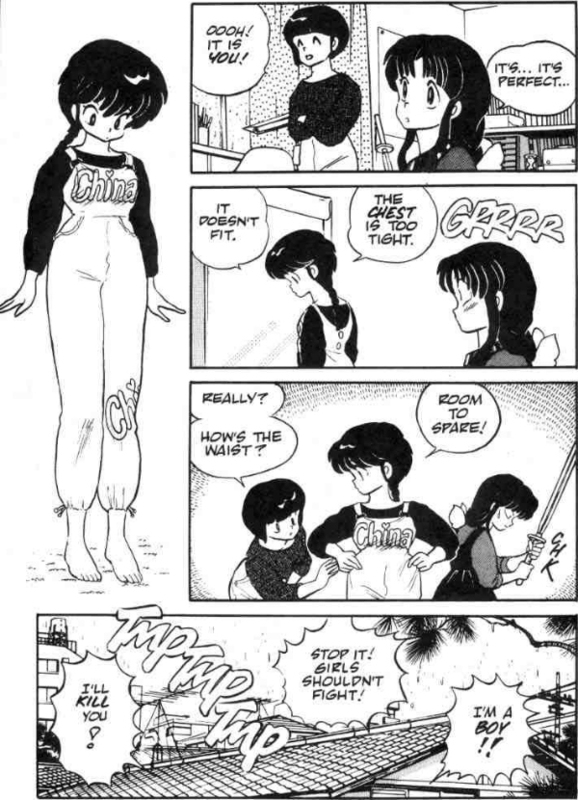 This chapter on crossdressing etiquette taken from the pages of Ranma ½ (らんま½/Ranma Nibun no Ichi) – Volume 2 (June 1, 1989) by Rumiko Takahashi. There’re two discussion topics that’re completely off-limits when it comes to women: age and weight. And, as Kyousuke Kousaka is about to discover, the female propensity for mind-reading makes it dangerous to even think about calling either one into question. Someone's clearly been taking lessons from Kikuko Inoue. This lesson in maid café etiquette has been brought to you by There’s No Way My Little Sister Can Be This Cute (俺の妹がこんなに可愛いわけがない/Ore no Imouto ga Konna ni Kawaii Wake ga Nai) – Volume 1 (October 27, 2009) by Tsukasa Fushimi and Sakura Ikeda.